Because I was lucky enough to get a dresser for Christmas (no, I didn’t have a dresser prior), the entire dynamic of my room has changed. The dresser is now the focal piece, a title that formally went to the small bookcase by my bed. With my new addition, my room needed a little revamp. But with limited funds, I couldn’t afford to go buy new decor and storage pieces. 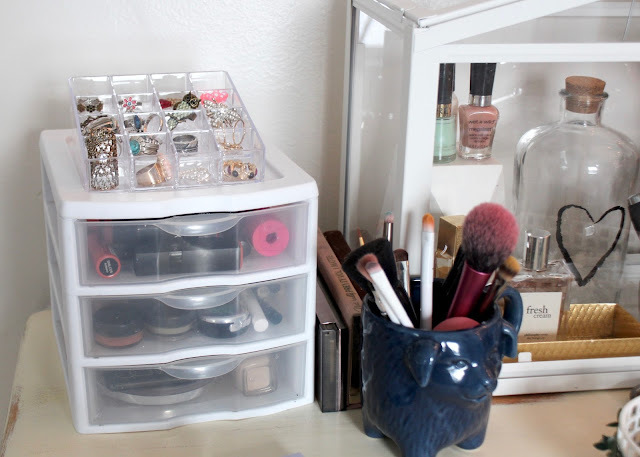 Instead, I shopped my bedroom, rethinking storage containers and changing up my decor. I am more than pleased with my results, and I didn’t have to spend a cent. 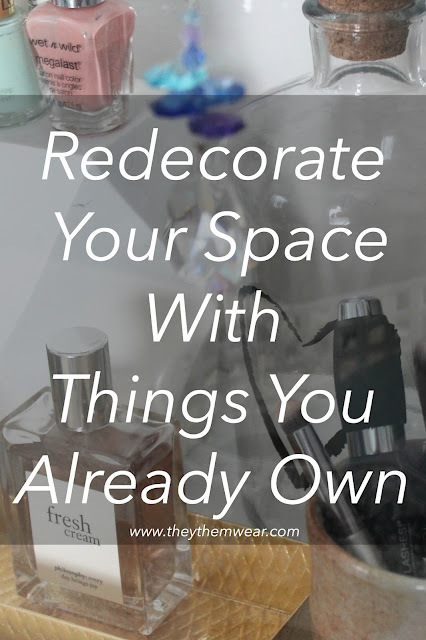 Here is how you can redecorate and reorganize your space using things that you already have in your house! I have three metal baskets around my room, two in green and one in blue. While two of them contain all of my journals, one has been floating around my room empty for the past several months. The idea didn’t come to me to put some stuffies in it until I realize that my frog and teddy matched my color scheme perfectly. Thus, they now live on my little bookcase, happily watching the world from my green basket. I also used a pink pot to hold my lotions, and a mug to hold my makeup brushes. Green and pink are my favorite colors, if you didn’t already know. Although I am pretty picky about them, I do like a lot of shades. In looking around my room at the decor I have, I noticed two shades that appear more than once- a bright Kelly green and a vibrant purple-toned pink. So what did I do? Collected my bright green and pink items and placed them all on my bookcase and bedside table. This way the area around my bed looks cohesive, and I can focus my baby pinks and darker greens around my dresser. Along with keeping colors coordinated, I also stuck with the same feel for each surface of my room. 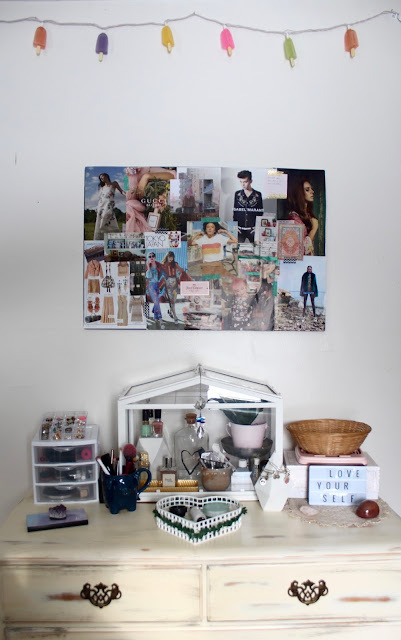 While my small bookcase is bright and fun and holds some of my childhood items, my dresser is soft and mature, using plants and makeup as decor. If you are lucky enough to have one single style and one favorite color, this step will be easy because your entire room will match without you having to keep similar styles together. With my Lisa Frank box on my bookcase and my favorite crystals scattered across my dresser, each surface has bits and pieces of things that bring me pure joy, without ruining the style. I found my crystals to go quite nicely with my various makeup and jewelry items. They all have a soft, sophisticated feel. For me, that’s my new dresser. But it can also be just about any piece of furniture or area of your room. It should be something that your eye is drawn to, whether because of the color, size or the way you decorated it. With my homemade poster above my dresser, your eye goes right up from the top of the dresser all the way to the ice-cream lights I have hanging above the poster. I hope those tips help you redecorate your room and spice up your surfaces! I had a lot of fun bringing pieces of myself to different parts of my room, and I am more than excited to finally own a dresser again, especially one so beautiful. If you would like to see a full tour of my decorated dresser, you can check out the video I made for my YouTube channel below.